"The basis for competition is evolving". That's a powerful quote from this deeply insightful report from Deloitte which focuses in upon the most business-critical changes taking place in the Food & Beverage sector today. Brand is no longer merely about the food served up to guests but increasingly is as much to do with how to engage with them in a digitally transformative way. The Hospitality Food & Beverage retail sector is facing all-but identical tidal waves of metamorphic change as its high street cousins. In the UK, the market has become supersaturated to the extent that we see many of the chains closing restaurants, entering into Company Voluntary Arrangements (CVAs) or failing altogether as rising rents, rates, staff and ingredients costs meld with a continuing squeeze on disposable incomes and associated falling guest numbers to create commercially challenging and turbulent trading conditions. The much-vaunted answer to these woes is often 'Digital Transformation' but what are the target business outcomes of such a process? Addressing the Guest Experience (GX) conundrum requires a firm, core appreciation of the data which underpins how a Food & Beverage business seeks to engage, empower, hear, delight and know guests. Deloitte's report uses identical language to that employed within Hitachi Consulting when it comes to the primary reason for improved data management, that is "gather data about your customers, turn that data into insights, and place those insights into action." We tend to call them 'actionable outcomes' and they're the same thing. The goal? Keep guests coming back to your restaurants - 60% say that a positive guest experience ensures that they dine more frequently. Once Food & Beverage retailers have a strong foundation for the increasing volumes of data they are amassing, together with properly structured processes to ingest, transform, store and analyse it with speed and consistency, the business outcomes can be profound. As an adjunct to that statistic on the end of the last paragraph if 60% of diners will willingly return when they feel engaged and listened to, think about the sales cannibalisation you're enduring if you blanket-bomb them with discount vouchers because you can't segment your guests due to poor or zero data insight... Surrendered margin in an age of massive competitive pressure and ongoing tempestuous trading conditions is simply unacceptable. 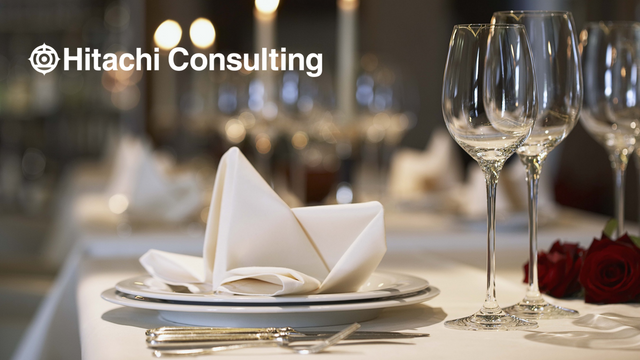 At Hitachi Consulting we're building such Data Platform Foundations for some of the UK's largest Food & Beverage businesses. They are designed to create a unified way of digitally connecting restaurants, suppliers, trading partners (such as home delivery providers, etc.) and critically, guests. These businesses realise that, to engage with and delight guests, it is essential to create holistic omnichannel experiences capable of facilitating mechanisms to also listen to the Voice of the Customer. Regardless of the demographic, we're living in an age where guests want to be understood and wanted - and data is the key to satisfying these desires as well as the currency which will enable you to compete successfully, improve sales/margins and run a profitable Food & Beverage operation.